Le Club AccorHotels France 150 bonus points per night between November 10 – December 31, 2016. The minimum stay length for this offer is two nights and maximum seven nights. The stay must have been booked between November 10 – December 10. Note that you can earn this bonus maximum of one time. Le Club AccorHotels doesn’t run promotion for stays in France as in other markets due to being market leader in the country. Some bonus points for those that have a stay in France before the end of the year. 1. 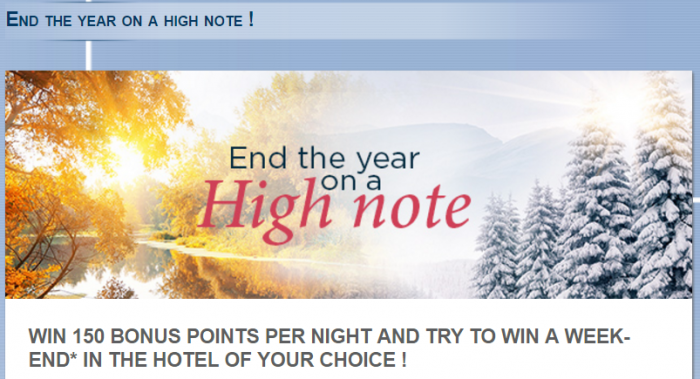 General Le Club AccorHotels terms and conditions apply to the End the year on a high note ! offer and you must be Le Club AccorHotels member to benefit from it. 2. This offer entitles Le Club AccorHotels members, regardless of their status, to benefit from earning 150 bonus points per night and participate to the final price draw in order to win 12 000 bonus points Le Club AccorHotelsfor a stay in one of the participating hotels in Le Club AccorHotels Loyalty program. 3. This offer is valid for a member’s stay from 10/11/2016 to 31/12/2016 in one of the participating hotels in France, and booked between 10/11/2016 and 10/12/2016. 4. The stay must be a minimum of 2night(s). The stay have to be a maximum of 7 night(s). This offer is available only one time per member, the max stay is 1 stay. 5. Any consecutive stays (check-out and check-in same day) in the same hotel, will be considered as a single stay. This single stay will be eligible once to the End the year on a high note ! Offer. 13. Please specify the reference 47840 in all your communications with AccorHotels call centers or customers care services related to this offer. You must register for the End the year on a high note ! offer before proceeding to the booking, to be eligible to the offer. 14. Each stay by a member from 10/11/2016 to 31/12/2016 automatically leads to its participation to its contest : price draw in order to win 12 000 bonus points Le Club AccorHotels. Previous articleInvitation For Short Q&A With Hyatt Gold Passport’s Jeff Zidell – Check Your Email!